North American hedgehog fans will be able to keep their heads warm with this pre-order Sonic hat, but gamers Down Under are heading towards a warmer time of year. What will they get to honour the release of Sonic Colours? Some figurines, that's what. EB Games Australia lists special editions for both the Wii and DS versions of Sonic Colours, both of which include special figurines in various combinations. Both versions come with an articulated Sonic figurine, with Wii owners getting the Cyan, White and Orange Wisps, while those who plump for the DS can get their hands on Yellow, Red and Blue Wisps. The special edition is also set to find its way to Europe via as-yet unspecified retailers. 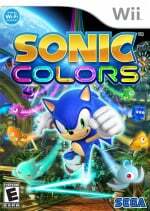 Sonic Colours is released in November. That's the dumbest looking Sonic figure I've ever seen! I'm really holding out my hopes that this (as well as Sonic 4) will be good (great?) games. I used to be quite the fan of the blue blur however the last release that caught my interest was Sonic Rush and even that somewhat disappointed. I am very much looking forward to a return to form as I'm sure a lot of other people are. My local EB in Canberra is promoting the blue headgear as well? Would they be giving both? I sure hope so! Those are some long arms sonic. "Hay cool I can have this if I go to Toys R Us here in the USA"
Nice but whats wrong with Sonic? I'd prefer the hat tbh. Hey James, here's your substitution for the hat we get. Nope Sega. Still not gonna buy it. I'm seriously considering pre-ordering Sonic Colours DS for that awesome hat (this coming from someone who's never pre-ordered anything). $50 isn't too bad a deal if I look at it as if I were paying $25 a piece. I'd love a second hat, but there's no way in hell I'd shell out the $80 that EB are asking for the Wii version (add another $10 for the special edition with the aforesaid figurines).